For this tofu banh mi salad, I marinated the tofu the day before for maximum flavor. I added a bit of salt to my marinade, since I used low-sodium soy sauce, as well as some fish sauce for more umami. I eliminated marinating the tofu in a plastic bag, and went straight into a dish (I saw flashes of squished sandwiches inside plastic bags, and though I know that sandwiches aren’t tofu, they’re both fragile). I flipped the tofu at the 10 hour mark so that they could get more evenly marinated. As my chopsticks skills are less than expected (I’ve failed as an Asian, sigh), I accidentally smashed a cube; this bit went into my mouth for early testing. I judged it to be the right saltiness, with that chewy factor already taking over the texture. I used 5 carrots, since I found a couple in the crisper that were getting mighty hairy. I cut the vibrant orange root into small planks like the ones you’d find inside a banh mi. I ended up doubling the pickling ingredients, since I had almost double the veg. I did 2 cucumbers instead of 1 cuke and a bunch of radishes, since I don’t really care for radishes. Save for daikon, especially the sweet Korean kind or the vinegary, garlicky one that I used to make and my brother used to hate. I ran out of energy and patience, in addition to the fact that my neck was sore from cutting those carrots, so I did a big dice on the cucumbers. I marinated both of the vegetables about 24 hours in advance. For the dressing, I used all the marinade (it seemed a waste to dump any of the liquid gold). I didn’t use any oil, since I like punchy dressings with minimal oil; this one already had some sesame oil, so I didn’t feel like I needed to add additional oil. Note that you don’t have to add the fish sauce if you want a vegetarian version; if you don’t have dietary restrictions, however, I highly recommend using it, as it adds a ton of flavor. I used half a loaf of bread; a whole loaf seemed like a lot. I also ended up using ciabatta instead of a baguette, since I like the chewy/crispy ratio. I tossed the cubes in oil, salt and pepper before baking them at 350F for 10 minutes. As for the tofu, I baked it at 300F for 1 hour; I was out, and my bro didn’t feel comfortable taking it out of the oven. I baked both about six hours ahead of time. I think baking the tofu is detrimental to the tofu’s yumminess. It was delicious just marinated, and I loved how chewy it was then. Baking it softened the tofu too much, while the top got leathery. The flavors also seemed more muted after baking. 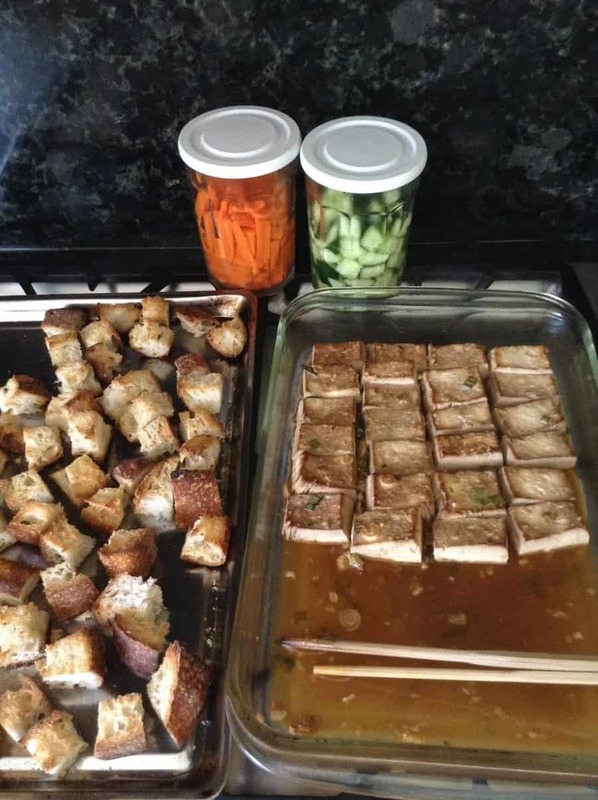 In the below recipe, I’ve taken out the baking; why have meh tofu in a tofu banh mi salad?? The marinated vegetables all had a nice crunch to them; though they were sweeter than I would have made them normally, I still enjoyed them. I’ve decreased the sugar for the cucumbers from 3 T to 1 T, and for the carrots 1 T to 1/2 T. The bread by itself was a bit hard, so I let it sit in the dressing a bit to let it soften up; alternatively, you could bake the bread less (maybe 8 minutes?). In a large bowl, toss the bread, dressing, vegetables and tofu. Top with sesame seeds. Combine everything but the chili-garlic sauce and marinate 4-24 hours. Mix the marinade with the chili-garlic sauce to form the dressing. Combine everything and refrigerate for 12-24 hours.